Rory Best, Jacob Stockdale and Iain Henderson are all back for Saturday’s clash with Leinster. 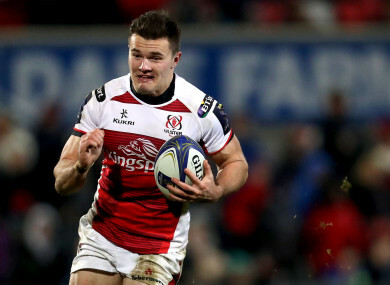 Stockdale is set to return to the Ulster side on Saturday. ULSTER’S RESOURCES HAVE been boosted considerably ahead of Saturday’s Guinness Pro14 inter-pro against Leinster with the news Rory Best, Iain Henderson and Jacob Stockdale are back in contention for selection. Best hasn’t played since the draw with Dragons on the first weekend of December but has now recovered from his infected foot to return to training ahead of this weekend’s visit to the RDS [KO 5.35pm, TG4, Sky Sports]. Henderson and Stockdale, meanwhile, come back into the fray after being rested for the New Year’s Day victory over Munster in Belfast, although Chris Henry remains unavailable through injury and Kieran Treadwell is rated as a doubt with an ankle problem. “We’re not sure on him, he didn’t train today,” Ulster coach Aaron Dundon said of Treadwell. Best’s return to the Ulster front row is a major fillip for Les Kiss after their pack was completely dominated by Munster last time out, and is good news for Joe Schmidt ahead of the Six Nations opener against France on 3 February. The Ireland captain has started just one game — the defeat to Leinster in Belfast at the end of October — for his province this season and although he played against South Africa and Argentina, is in need of game time ahead of the 2018 championship. Both Henderson and Stockdale sat out last Monday’s game at Kingspan Stadium due to the player welfare programme and will bolster the northern province as they look to end Leinster’s six-game winning streak. Ulster make the trip south for the round 13 clash in third place in Conference B, six points behind Leinster. Email “Ulster boosted by return of Ireland trio for inter-pro visit to RDS ”. Feedback on “Ulster boosted by return of Ireland trio for inter-pro visit to RDS ”.